The hourglass was one of the earliest timekeeping devices. As such, its connection to time-related symbolism is undeniable. This nature of the symbolism of time is really up for personal interpretation. You can perceive it as a reminder that all bad things will soon pass or as a symbol of remembering to appreciate the time that you do have. Either way, the hourglass forces us to acknowledge the transient and ever-changing nature of our lives. In addition to time-related themes, the hourglass is synonymous with cycles and balance. Ancient alchemists recognized the concept of balance in the hourglass. Its very shape is made up of triangles balancing each other out. Alchemists interpreted these triangles as representing two aspects of nature: the upper being the sky and the lower equating with Earth. Energy passes between the two sides of the hourglass just as the energies of our world are contained by the atmosphere and crust. All of the natural processes and cycles occur there (not including what happens in space, of course), which gives us a greater sense of relation with our environment. This also forces us to realize our role(s) in the natural cycles happening around us. Another common theme associated with the hourglass symbolism is the idea of inevitability. All of the events in nature run on cycles and, although we do have a say in our lives, there are some cycles that just cannot be stopped. This is a good thing, since Mother Nature usually knows best. It should also be a little bit comforting to know that life will always prevail, one way or another. Nothing is completely in our own hands. We must trust that nature will guide us in the right direction to some degree. When it comes to sexuality, nothing is more feminine and luscious than an hourglass figure. The curvaceousness of the shape directly references the female and the specific cycles that she experiences in her life. As it is fully developed, the hourglass symbolizes a woman who has gone through the cycle of maiden to mother to crone. This spirit symbol shows that she has both learned and grown. It channels all of the female energies into a single object that also happens to do with the passing of time. However, the balancing aspect of the hourglass brings about the concept of duality. When considering the dual nature of life, many examples come to mind: yin and yang, sun and moon, male and female, life and death, etc. This is demonstrated in the physical composition of the shape as well as the specific positioning of each element. One of the triangles is erect while the other is inverted. Together, they represent the gender specific body parts, with the erect triangle mimicking a phallic nature and the inverted representing a womb. Certainly, these two triangles together convey the undeniable connection between male and female bodies as well as their spiritual energies. To dream of an hourglass symbol will ignite similar themes. Most likely, though, an hourglass appears in your subconscious when you are worried about time. Perhaps there is a prior engagement or deadline that is rapidly approaching, and your awareness is trying to alert you. Maybe you are not spending your time wisely, focusing too much/too little on certain areas and throwing off the balance necessary for healthy and happy living. When symbols deliberately make their way into our awareness, they are doing so in an attempt to help us to help ourselves. Although the hourglass symbol speaks of eternity, it also encourages us to not take our lives for granted. 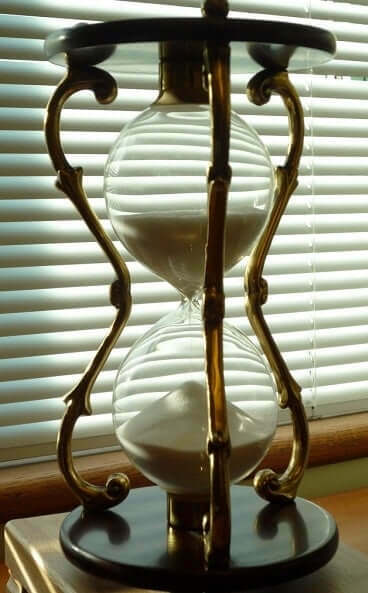 If and when you experience an hourglass in a dream, you would do well to evaluate how you have been spending your time.